With a voice that is sure to grab your attention, Skyy Jones is putting it all on the line as she prepares to release her debut album. This Philly native says she was born to do music. Her passion for what she does is undeniable. With raw talent, and effortless style reminicent of some of your favorite artists from the 90's, there's certainly room on the charts for this up and coming artist. With a beauty that seems timeless matched with pure talent Skyy Jones is surely one to keep an eye out for. Influenced by the likes of Mary J Blidge, Brandy, SWV, Luther Vandross and Anita Baker just to name a few she is well-seasoned when it comes to Soul Music. "Growing up in the 90's when our parents were listening to music from artists like Anita, Brian, Luther, Tony, Babyface and Michael Jackson, its hard not be heavily influenced by that era of music." Skyy Jones is not only an incredible singer, she also writes her own music. Writing poetry from the age of 9, her love for writing soon turned into writing lyrics to her very own songs. Creating a lane for herself, Skyy Jones has a sound that isn't quite like any other artist out there. Her unique sound and style reminiscent of some of your favorite artist from the 90's separates her from most of music we hear today. The passion of Mary J, combined with the sweet sound of Aaliyah mixed with the soul of Anita, Skyy is just the recipe needed to get people excited about RnB music again. With the release of her head bopping single entitled "Get To The Bag" produced by Krazy Figz, this is surely just the start for this Independent Artist. Working on the release of her EP album, Skyy says that she wants people to feel good about RnB music again. "I love some of the music from today's artist but its just something missing, let's put the soul back in RnB." 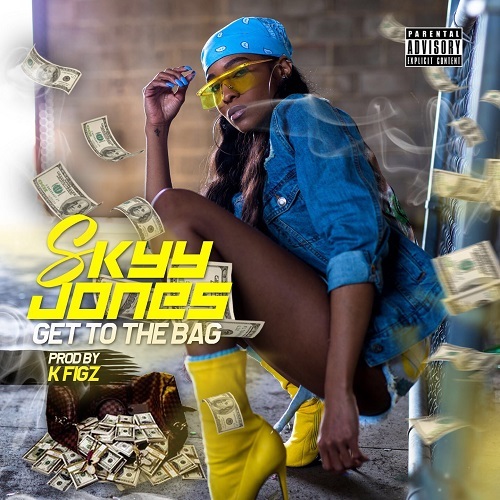 Skyy Jones "Get To The Bag", produced by Krazy Figz drops on April 20, 2018.